I like that this Banana Split Smoothie powers the kids up with protein in the morning and that they drink every last drop. Really, this Banana Split smoothie tastes far more decadent than healing. Last week I shared with you lovelies three new must-try smoothie ingredients—banana peel being one of them. These and other great ideas were ones I gleaned from Daniella Chace’s little gem of a book Healing Smoothies: 100 Research-Based, Delicious Recipes that Provide Nutrition Support for Cancer Prevention and Recovery. I have turned to this book countless times for fresh smoothie inspiration and wanted to share a recipe out of the book that we make quite often. I like that this Banana Split Smoothie powers the kids up with protein in the morning and that they drink every last drop. Really, this Banana Split smoothie tastes far more decadent than healing. But healing it can be! Resveratrol, found in peanuts and peanut butter, has been found to suppress intestinal cancers. The cocoa and vanilla fragrances stimulate the appetite while the peanut butter and vanilla bean flavor hit the palate. The taste is reminiscent of chocolate ice cream. Yum! What brand of protein powder do you like? Reset360 All-in-One Shake ( http://www.saragottfriedmd.com/hormone-shakes ) Chocolate and Vanilla are both good. Nutiva ( https://store.nutiva.com/plant-protein/ ) Is a bit gritty. Great recipe! Definitely need to try it. I get in a smoothie rut, lol. Wait, banana peel?! I love cherries and pb together in a smoothie, so this is happening. Hmm, I think I even have some frozen cherries on hand. Looks so delicious! Need to add this to my smoothie list! This looks delicious! I need to get a copy of that book! I’m not sure why but i totally got out of my daily smoothie habit, this makes me want to take it back up!!! Cherries are so great at fighting inflammation after all my runs! My smoothie habit comes and goes, too. Kicking it back into gear. It makes such a difference during the sickie season. 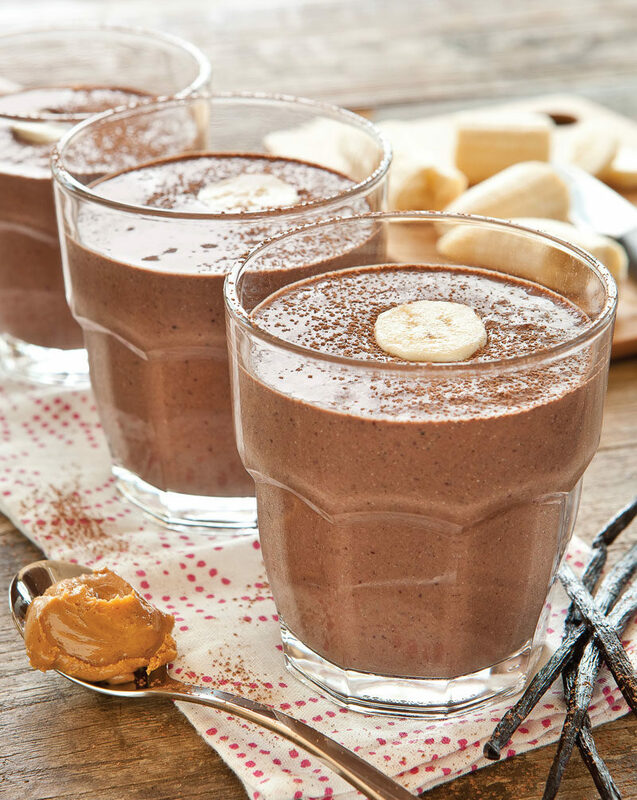 You had me at banana and peanut butter! The best combination! YUM! YUM!!! Love the cherries in there. I might just try this tonight for a healthy sweet treat! This is one of my all time favorite smoothie combinations! I usually just use chocolate protein powder, so I will have to try the combination of vanilla protein and cocoa. This is a smoothie that I would love to sip on! Looks great!